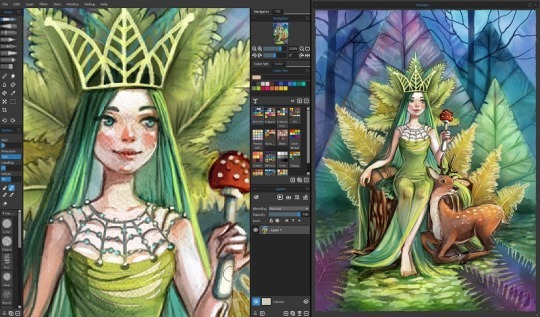 In the last blog post we announced the upcoming arrival of a brand new Rebelle 3 that will feature ultra realistic watercolor papers and authentic blow tool, support for various watercolor behavior via new ‘Visual Settings’ panel and a new ‘DropEngine’. Today we’d like to introduce other set of features that will make you fall in love with this software even more: ‘Masking Fluid’ layer, Ruler & Perspective tools, Reference Image, Image Preview & Canvas size tool. Last year, Rebelle 2 introduced various tools for creating mask on canvas including selections and stencils. With stencils you could simply grab ink, pencil or any other tool, paint a mask on the canvas and create a stencil from it. Or you could create a selection and turn it into stencil with just one click. Rebelle 3 will go even further and feature a ‘Masking Fluid’ layer which locks non-transparent pixels of the layer. When painting on ‘Influenced layer’, all pixels will be masked by the ‘Masking Fluid Layer’. 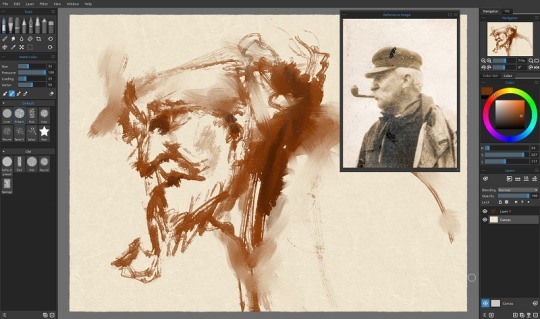 This is a quick and easy way of coloring sketches and images. The next Rebelle version will bring new possibilities for drawing straight lines and perspectives. Fastest way to paint a straight line in Rebelle 3 is to press a [Shift] key, set the starting point, press the mouse button or a pen to set the ending point and naturally draw the line between the points. It is beautiful and simple tool probably available only in Rebelle. You can paint the straight lines also with the new Ruler tool. You can lock the control points if you don’t wish to move the ruler, or paint with a freehand, so the lines will not be so strict and artificial when painting. New Perspective tool will act as an assistant for drawing perspectives. You will be able to select from one point, two or three point perspective. You can lock vanishing control points, lock the horizon or also paint with a freehand. Reference image panel was one of the most demanded features from Rebelle users. This panel will serve as a visual guide while you paint. You will be able to place the panel anywhere on the screen, docked or floating, and open a reference image, sketch or photo into it. You can Zoom in/out the image or desaturate the image with ‘Greyscale’ button. Other great news is the implementation of ‘Canvas Size’ - a new tool that will serve for cropping, scaling and resizing your work. Resize the canvas interactively by using the control points, or by entering the desired size of a new canvas in the edit-boxes. You will be also able to resize the image and change its DPI. When cropping a paper with the deckled edges, the newly created canvas edges will nicely adjust so you don’t lose the edges on any side. Rebelle 3 will be available on our website from April 30th 2018 for the full price $89.99. All existing owners of Rebelle 1 or 2 are eligible for more than 50% discount - regular upgrade price will be $39.99. Users who purchased Rebelle within last two month, from March 1st 2018 will be eligible for a free upgrade. On April 30th, we will send out newsletters with more information on how to upgrade - definitely check your Inbox and Spam folder, so you won’t miss it! Meanwhile, let us know in the comments below what new features you like the most and we’ll pick another winner who’ll get a free copy of Rebelle 3!